Newsom Oil has been in business since 1929. It was started by Major Charles Newsom, then operated by his son M. C. Newsom, Jr. and is now run by his grandson David Newsom. This business has quite a family legacy here in the Roanoke Valley. Newsom Oil is a full-service LP gas distributor, offering oil and gas for heating fuel, commercial sales, HVAC service, as well as selling LP gas appliances, fireplaces, gas logs, grills and more. David Newsom wants consumers to know that oil and gas are cleaner and greener fuels, so much so that his slogan for the rockfish Newsom Oil launched is “Cleaner and Greener Fuels. This “Rock” Powered by Oil & Gas. Get Hooked on Newsom.” The fish was painted by local artist Tina Gregory and depicts an old-fashioned gas truck that was inspired by on of David Newsom’s old cast iron toys. The dominant color is green, echoing the cleaner, greener fuel message. 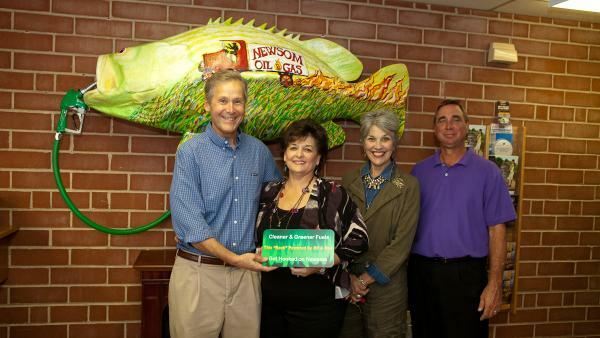 Newsom Oil added a green gas hose and nozzle in the fish’s mouth.